copyright © 2002 by Jeffrey L. Thomas. fter the accession of Henry II castle warfare began slowly to take on a different character. On the one hand, defence was assisted by developments in the plan and construction of castles; on the other, the weaponry of attack was generally improved. In the castle itself walls became thicker; corner and mural towers were built to give enfilading fire. Loops were located in the walls with increasing regard both to the field of fire which they could control and to the convenience of the archer. The walls were crowned with battlements which gave protection to the defenders, and the gaps between the merlons were often guarded by hinged flaps. The entrance, always the most vulnerable point in the circuit of walls, was protected by a gatehouse, which, when fully developed, consisted usually of an entrance tunnel set back between drum-towers and further protected by drawbridge, portcullis and stout oaken gates. 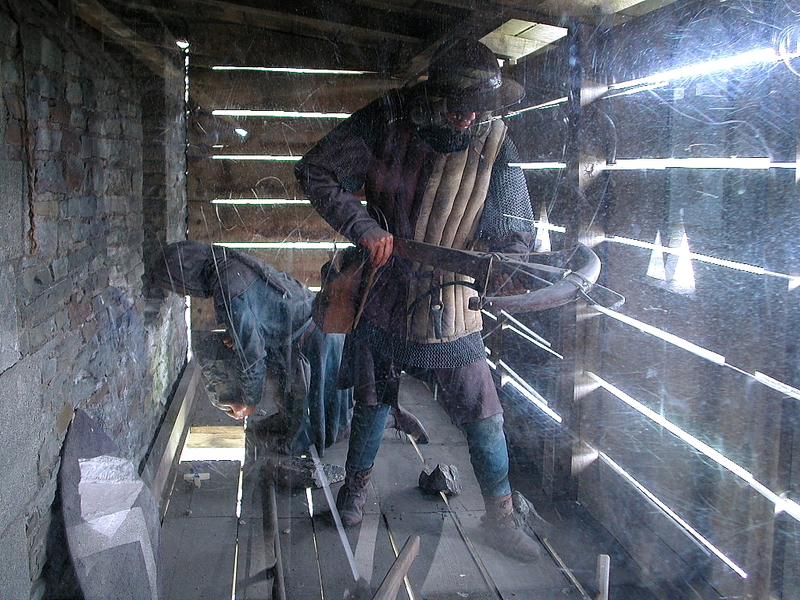 The defence was assisted from the later years of the 12th century by the introduction of the crossbow. The traditional English bow was the short-bow, with a range of no more than 200 metres. The medieval crossbow derived from the classic balista. It was a more accurate weapon, with a longer range, and the quarrel which it fired was in all respects more deadly than a simple arrow. It had been condemned by the Papacy in 1139, but never ceased to be used. It was adopted in England in the later years of the 12th century. Richard I favoured it, and from the time of King John small bands of balistarii, or crossbowmen, were stationed in the more important castles. The crossbow gave the defence a considerable advantage during the 13th century. But it's rate of fire was slow and the archer needed protection while drawing his bow. Loops facilitated sighting the bow, and the wide internal splay gave the bowman room to handle his weapon. The crossbow was a remarkably accurate weapon, capable of picking off defenders on the walls and even of shooting a quarrel through a loop and hitting the defender. Its accuracy and range led to the construction of wooden shutters and bretaches over the tops of castle walls. Attack was assisted by a variety of "engines" which threw missiles, usually stones, into the castle. They made use of tension, as in a bow, of torsion and of counterpoise. Most had been used in classical times. All were used in the Middle Ages to beat down walls and crush buildings and also defended against all that approached their walls too closely. The term ballista usually denoted a great crossbow operated by the tension of the bow; the springal relied on the tension of a bent beam of wood, and the mangonel on the torsion of tightly twisted rope. 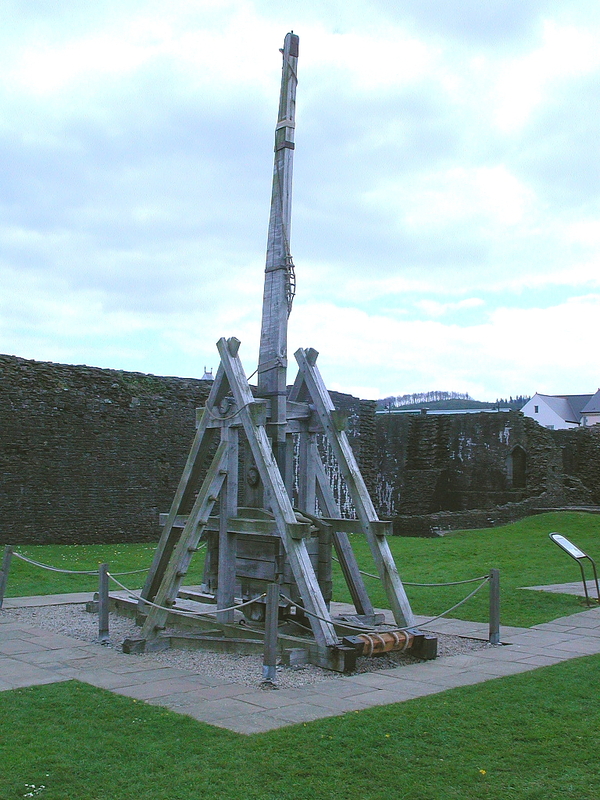 Only one engine was the invention of the Middle Ages, the trebuchet. It relied on a counterpoise and was simpler in design and construction than most others. Prince Louis of France is credited with bringing it to England in 1216. Various engines were constructed in the king's North Wales castles of Deganwy and Dyserth, where four "switches" were built for catapults and mangonels. It was usual to drag these machines around the country as need arose. Attackers had a range of options. They could pulverize both the external walls and buildings within by their artillery; they could pick away at the walls with a "bore," or undermine them by tunnelling, and they could make a direct assault either with ladders or by building a mobile wooden tower which could be advanced to the walls. In the last resort a castle could be isolated and forced into surrender by starvation. All methods were used. 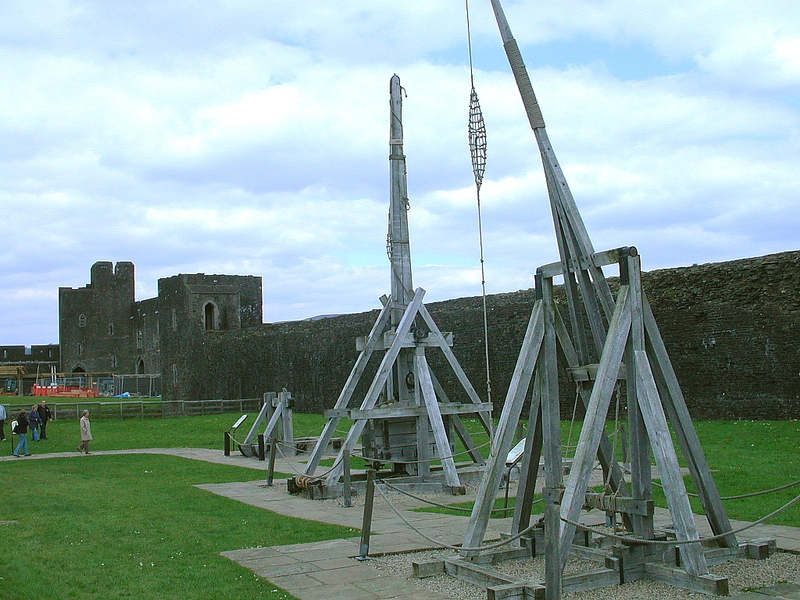 Most siege engines were capable of throwing a stone of 300 lbs or more a distance of at least 150 metres. Stones of this weight have been excavated at Kenilworth Castle, where they were probably used in the siege of 1266. Siege engines were heavy and clumsy. 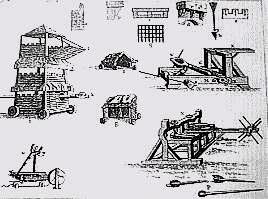 Kendall claimed that the seven trebuchets used at Berkhamsted called for fifty-six long-carts for their transport. It seems more likely that siege engines were constructed at the site, as they were when the Welsh attacked the castles of Mold and Dyserth. Wooden towers were sometimes pushed close to the walls, which were then assaulted by foot soldiers gathered on their upper levels. The Justice of Chester was in 1244 ordered to have four good strong wooden towers built in the forest of the Wirral and to have two such towers made as close as possible to the border to carry wherever the king may wish in Wales. Not surprisingly, the long, slow siege was preferred, and for this reason castles that were at risk were usually well stocked with food. Most provisions, however, had only a short shelf-life and had to be frequently renewed. For the most part the attackers put their trust in having sufficient time for the slow process of starvation to compel the surrender of the castle. The besieged, however, always counted on the timely arrival of a relieving force. A set of rules was worked out and was normally adhered to. A siege became a kind of poker game governed by strict rules. In the siege of Dolforwyn, the garrison "gave eight hostages, the best after the constable, as a guarantee that they will surrender the castle on the Thursday after the close of Easter unless they are relieved by Llywelyn, and if relieved, the hostages are to be returned to them." The choice of date by which the castle should be relieved or surrendered was crucial and represented the gamble in the negotiation. Whenever a castle was yielded the garrison was usually allowed to march away. Only when it was taken by assault do we find evidence of a wholesale slaughter. The Medieval Castle in England and Wales. N. J. G. Pounds, Cambridge University Press, 1990. Learn more about medieval siege warfare by visiting the NOVA web site pages on life in a medieval castle. 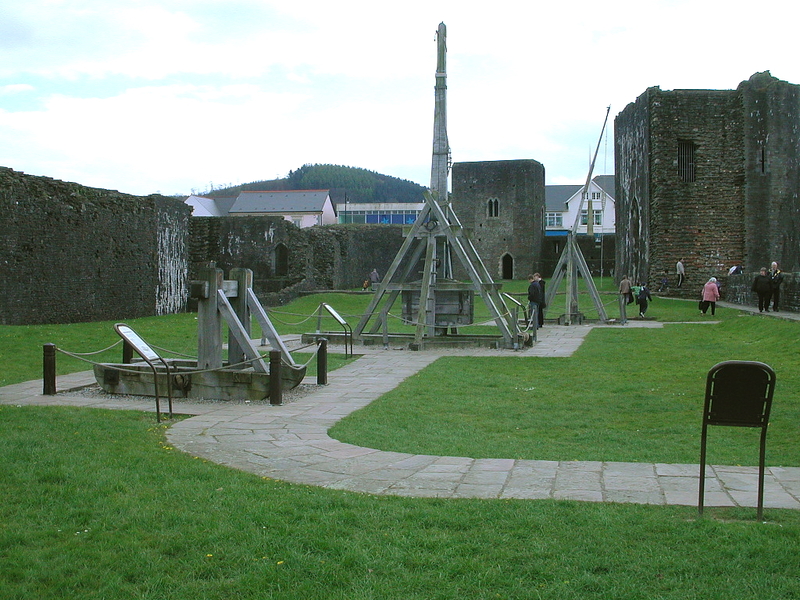 The site teaches visitors about medieval siege engines, in particular the trebuchet, a fearful weapon used against castle defenders. The NOVA site explains how their team of engineers and historians built their own a working trebuchets, a story that was featured in a recent PBS NOVA television episode. You can even try out the trebuchet yourself via an interactive game! A very entertaining and informative site. Highly recommended.